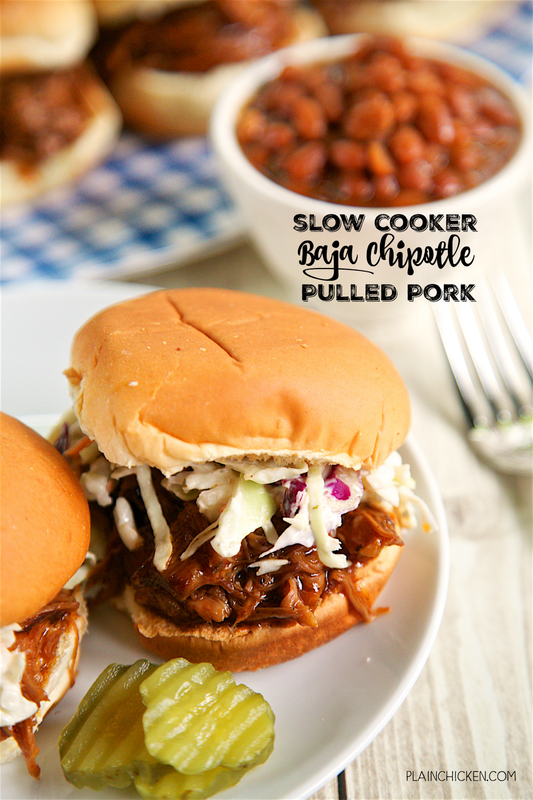 Slow Cooker Baja Chipotle Pulled Pork - only 4 ingredients! A little sweet and a little spicy. Cooks all day in the crock-pot. SO easy and it tastes AMAZING! Great for a crowd and tailgating! Serve as a sandwich, on a baked potato, over a salad or on top of nachos! This is super simple to make. 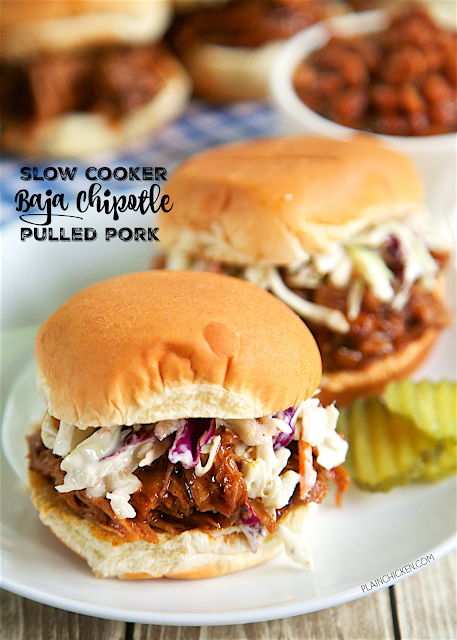 Season the pork with some BBQ seasoning, put in the slow cooker, top with BBQ sauce and the Baja Chipotle marinade and let it slow cook all day. It smelled fantastic while it was cooking; I couldn't wait to tastes it. OMG! SO good! 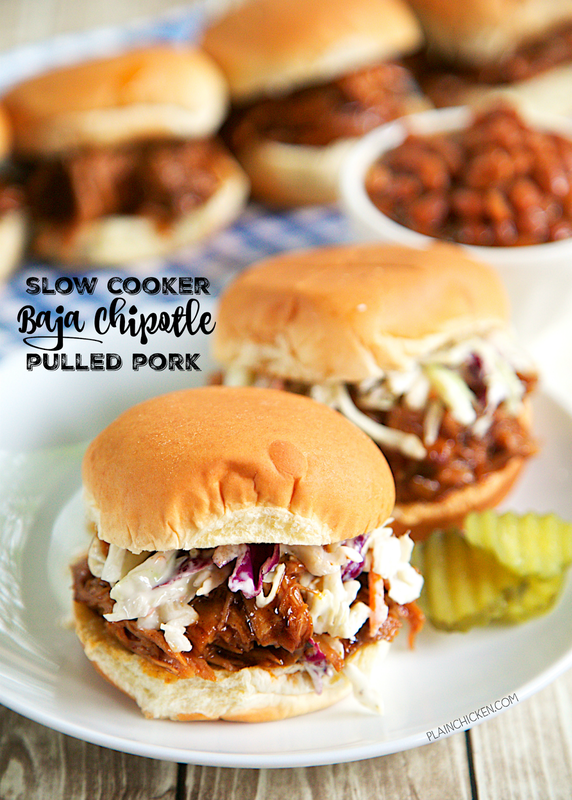 Tender, juicy and full of amazing flavor! We served this on slider buns and topped it with some extra BBQ sauce. 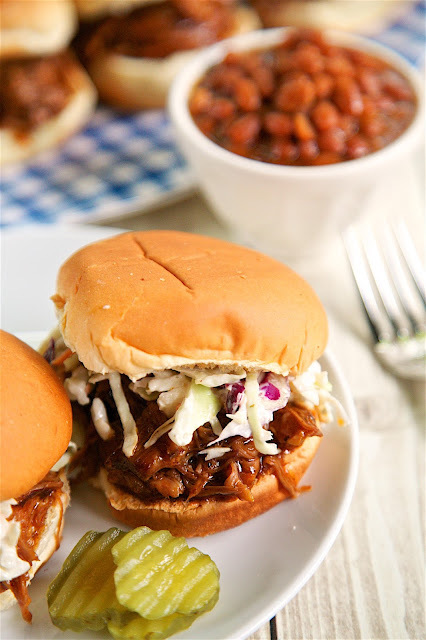 You can also top with sliders with some coleslaw and fried onions. The leftover pork is great on a salad, on top of nachos or in a quesadilla. Rub BBQ seasoning over pork. Place in slow cooker. Add BBQ sauce and marinade. Cover and cook on LOW for 10 hours. Shred pork with 2 forks. Stir to coat pork in sauce. Serve on buns, over a baked potato, on a salad or on nachos. 2 questions - is that sauce very spicy and what kind of BBQ seasoning do you use? I have seen a couple of recipes lately calling for BBQ seasoning but not sure what it is. I like all things chipotle so I'm sure I would enjoy this.